First time I taught about Value Stream Mapping was back in 2008 internally, beginning 2009 publicly. First time I tried it was somewhere in 2006 if I am not mistaken. In the mean time I have used it a lot more in a lot of different scenario’s, unfortunaly not ever having a complete value chain in the picture but then again… enough to see the benefits of making things explicit for the people involved. What is that Value Stream Mapping exactly? I will not even try to explain in my own words on a blog, you have to experience the power of it but you could start googling for it to gain some more insight or just wait a bit until it pops up at our training schedule. Wikipedia tells us the following: “Value stream mapping is a lean manufacturing technique used to analyze the flow of materials and information currently required to bring a product or service to a consumer. At Toyota, where the technique originated, it is known as “material and information flow mapping”. It can be used in any process that needs an improvement.” So where could you start? If possible really start to follow a request through the system, noting everything that is happening, timing every action, wait time, queue sizes… till it gets DONE. Depending on the process and tools in place this can either be done very easily or become very difficult to do. Being Agile I do not like the difficult things and for the latter part I like to replace all measuring and real token following through the system, by a collaborative workshop with as much workers as possible. The biggest group I faciliated in a manner as described below is about 30 persons and I think this is about the limit for it. If you need more people then other facilitation, information gathering and communication techniques come into play. Pretty similar to my previous post about innovation games, you gather data, analyze and take action. But in a specific manner. Workshop layout and walkthrough Step 1: You ask all workers within the process to go 2 days back in their memory and try to recover what they were actually doing at work, from coming into the office in the morning till going out of the office in the evening. Let them close their eyes while doing so… now ask them to put everything, even silly things on a post-it note and keep that for themselves. Step 2: Repeat the above but for yesterdays workday. Step 3: Explain the people the purpose of a large brown paper that you hung up before, left side is where the process starts/the requests comes in, right side is where it ends/the request goes out. Now guide the attendees to hang their post-its on the brown paper accordingly and collaboratively, facilitate this well because this is really the basis. Step 4: Guide the people to really draw the lines on how the actions are linked to each other, including feedback loops. At the end walk through the process yourself by explaining what you see to the group and let them correct where needed, this will help you to have a more complete picture and more correct visualization of the process. Step 5: Identify where queue’s are sitting, how many items in the queue’s approximatly. If they can not get to the figures within 2mins then let them collaboratively agree on a number so that you keep the workshop moving and energy flowing. Step 6: Let the group come to a consensus on the cylce time of the process for a urgent/high priority request going through the process and for a normal request. In the example below: High priority = 4-5 Months; Normal = +/-12 Months. Step 7: Explain the persons what Non Value Add (NVA) is, what Business Value Add (BVA) is and what Customer Value Add (CVA) is and how it relates to knowing who your customer is and what they really want. So This time we go a bit away from the process and use some other facilitation technique’s which I might post sometime later but for now let’s focus on the needs for the VSM… and come to a consensus on the customer and her real need/purpose/value and hang this at the center (orange post-its in example below). Step 8: Identify the BVA & CVA activities from the post-its in the process. In our example here about 5 BVA activities and 3 CVA activities. Step 9: Add guesstimated timings to sub-processes for a request to pass through – also cycle times. Add timings to the activities, really the time average spend on a request doing that activity – touch times. Step 10: Calculate the process cycle efficiency by adding up all touch times from CVA defined activities divided by the total cycle time of the process. In the example given we came to a result of approximatly 7% process cycle efficiency, which is actually not that bad according to my experiences in software development environments. Step 11: Divide the people into 4 groups where each group thinks about 2 improvements to the system as they see it on the wall, only using the facts as they as a group agreed on. We ask for 2 improvements to limit the risk that all groups choose the same or similar improvement. Step 12: Let the groups “sell” their improvement to the other teams, if accepted put it as an action item with responsible lead and estimated deadline. If you have 2 groups with a very similar improvement idea then make them choose for 1 and keep the other in the backlog for the case their first choice doesn’t work out as they thought it would. Step 13: List all improvements yourself and faciliate the group to come up with an estimated cycle time for high priority and normal priority requests. In our example the 4-5 Months became 1 Month and the +/-12 Months became 3 Months, so about 1/4th of what it was before making the things explicit and this with only 4 agreed upon improvement steps to the system. Thank you VSM! Step 14: Schedule the necessary follow up meetings and already celebrate for the given improvement idea’s and estimated cycle time improvement. 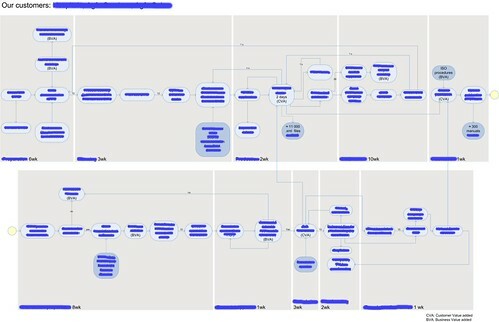 Couple of months later I went back to the group and it seems they digitalized the VSM results in a process map, included actions items, progress on them and other relevant information onto their team wiki space and were moving forward indeed, slower than initially expected but still moving forward. I’m looking forward to have another VSM session with the same group of people in a couple of months and to see what is really different now and how close they came to their own expectations. And also here I’ll end by stating that I really do love workshops like this where people leave energized, smiling and with a plan to move forward and seriously improve their work life.